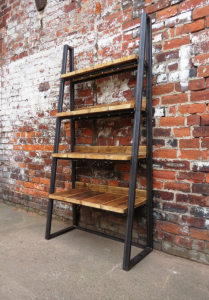 The newest trend in home design is the industrial – robust, sturdy iron decor meets rustic wood. 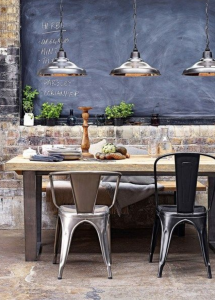 This trend is wildly popular with men, who love the exposed brick, darker colors and cozier feel of the home. However, it’s easy for women to fall in love with it too. 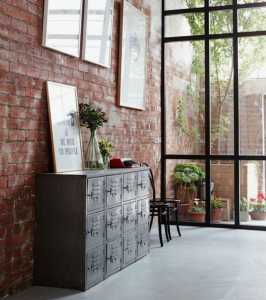 This blog will go over just how to accomplish the industrial chic decor – an easy mix that both husband and wife will love. Suggestion #1: Use windows to your advantage. You can still have a warm, cozy feel in your home (accented with darker colors) and let natural light in at the same time. Women love the open, airy sense that windows bring – so this is a great compromise for the two of you. Suggestion #2: Add some color. Neutral color, that is. 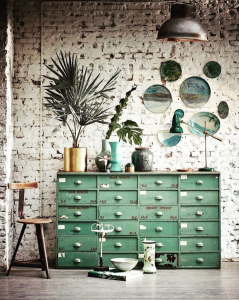 Green is a great color to accent with, as shown above – especially against a bright neutral brick background. 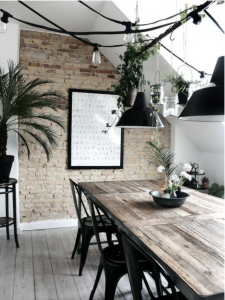 Accented with an industrial lamp and potted plant, it’s a relatively easy look to accomplish! *Note that most of these looks include an exposed brick wall. It’s fabulous if your home is older or renovated and has a wall or two to play with, but if it doesn’t, no worries. You can hire a talented painter to create the brick look for you, or if you’re willing to put forth the monetary investment, install some indoor brick! Suggestion #3: Decorate with useful storage items. This locker unit is incredibly useful for storage and conveniently hides the contents – unlike an open shelving unit. Plus, a unit like this is considerably less expensive than a wood piece of furniture. You can find plenty of affordable options around town, too. Suggestion #4: Do it the easy way. Focus on the accent pieces to accomplish the industrial look. Lamps and dining room chairs are the easiest to mesh with your existing decor, and make a huge impact in the trend you’re going for. *Bonus: pieces like this (including affordable options!) are available everywhere. Suggestion #5: Start with one piece of furniture. Take a piece like this (courtesy of Etsy) and put it in a prominent place in your home. An easy piece like a shelf is great to start with, since it will mesh with the current feel of the home and establish a new trend, as well. For the crafty folks (or those of us with handy men in our lives, or if you’re a handy man yourself), the Cottage Market has put together 35 d.i.y.’s to achieve the industrial look here. Take a look at our Pinterest board compiling a bunch of our favorite industrial designs! We’ve also pinned a color palette we love, amidst several easy design accents like vintage fans. What are your favorite industrial designs? Let us know in the comments below!